Geronimo (Mescalero-Chiricahua:”the one who yawns”; June 16, 1829 – February 17, 1909) was a prominent leader and medicine man from the Bedonkohe band of the Chiricahua Apache tribe. From 1850 to 1886 Geronimo joined with members of three other Chiricahua Apache bands—the Tchihende, the Tsokanende and the Nednhi—to carry out numerous raids as well as resistance to US and Mexican military campaigns in the northern Mexico states of Chihuahua and Sonora, and in the southwestern American territories of New Mexico and Arizona. 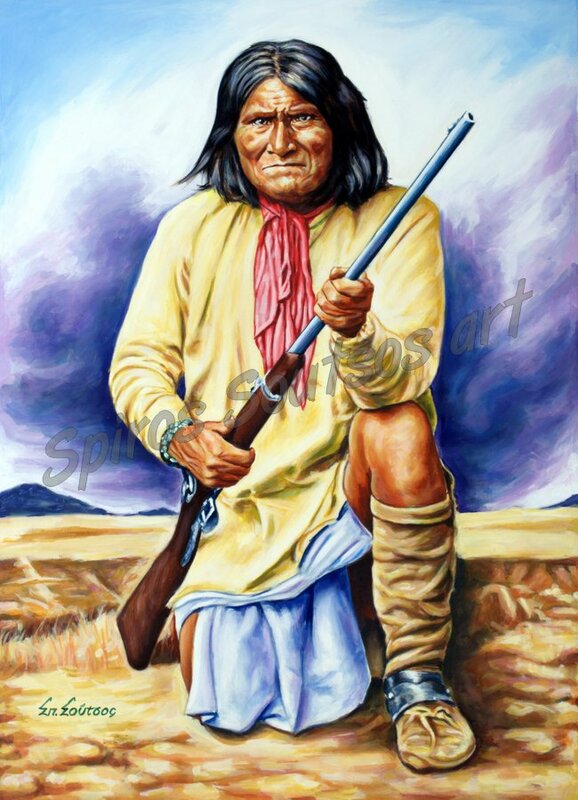 Geronimo’s raids and related combat actions were a part of the prolonged period of the Apache–United States conflict, which started with American settlement in Apache lands following the end of the war with Mexico in 1848. 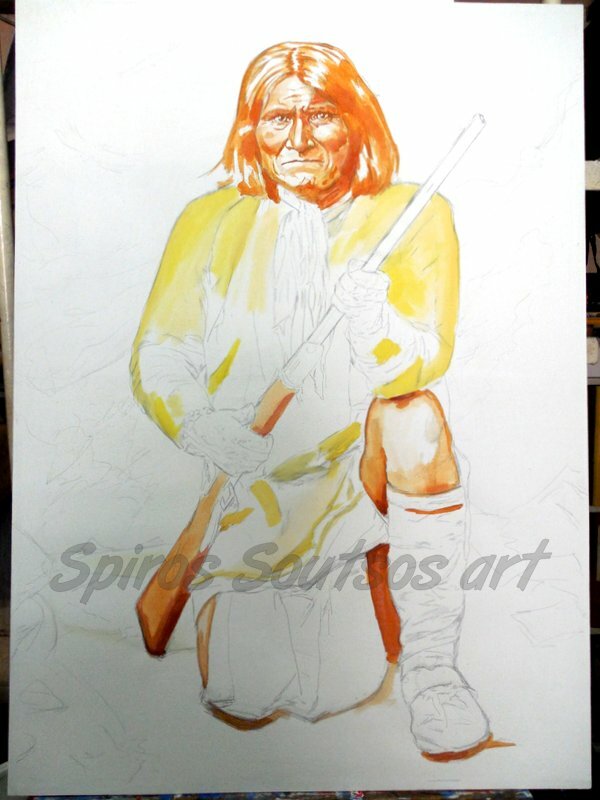 While well known, Geronimo was not a chief among the Chiricahua or the Bedonkohe band. At any one time, about 30 to 50 Apaches would be following him. However, since he was a superb leader in raiding and warfare he frequently led large numbers of men and women beyond his own following. 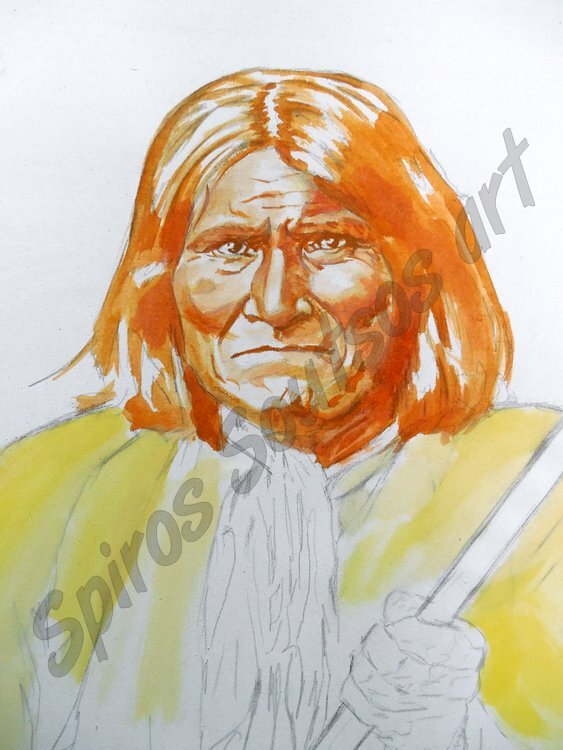 During Geronimo’s final period of conflict from 1876 to 1886 he “surrendered” three times and accepted life on the Apache reservations in Arizona. Reservation life was confining to the free-moving Apache people, and they resented restrictions on their customary way of life. In 1886, after an intense pursuit in Northern Mexico by U.S. forces that followed Geronimo’s third 1885 reservation “breakout”, Geronimo surrendered for the last time to Lt. Charles Bare Gatewood, an Apache-speaking West Point graduate who had earned Geronimo’s respect a few years before. Geronimo was later transferred to General Nelson Miles at Skeleton Canyon, just north of the Mexican/American boundary. Miles treated Geronimo as a prisoner of war and acted promptly to remove Geronimo first to Fort Bowie, then to the railroad at Bowie Station, Arizona where he and 27 other Apaches were sent off to join the rest of the Chiricahua tribe which had been previously exiled to Florida. In his old age, Geronimo became a celebrity. He appeared at fairs, including the 1904 World’s Fair in St. Louis, where he reportedly rode a ferris wheel and sold souvenirs and photographs of himself. However, he was not allowed to return to the land of his birth. He died at the Fort Sill hospital in 1909. He was still a prisoner of war. He is buried at the Fort Sill Indian Agency Cemetery surrounded by the graves of relatives and other Apache prisoners of war.